An all-green salad packed with flavours and textures designed to complement crispy-skinned fish. This is a salad I make to go with – or, more specifically, under – pieces of crisp-skinned fish. It combines a range of textures and flavours that complement fish very nicely, and all in tones of green, from the softness of avocado, the slight squidginess of Puy lentils and crunch from pepitos, along with the freshness of dill and punctuated with spring onion. 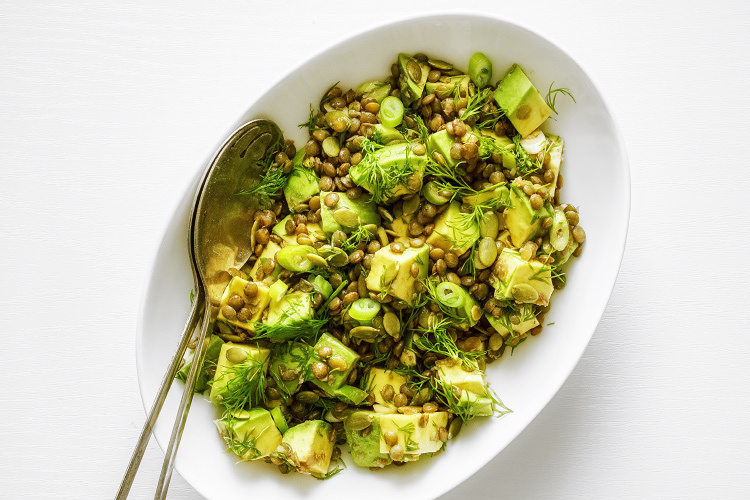 What ties it all together is lime: you cook the lentils with lime zest and macerate the onion in lime juice (to cut down its burn), which is then recycled into the dressing. If you're in the mood to add a note of spicy heat, try adding a finely sliced long green chilli or jalapeño pepper, deseeded to taste. Don't let this salad sit around. While the lentils can be made ahead and left in their saucepan until required, everything needs to be tossed together just before serving to keep it fresh and sprightly. Put the lentils and 375ml (1½ cups) cold water in a small saucepan. Using a fine grater, add the zest of the lime. Place the saucepan over medium heat and bring up to a simmer, letting them cook for 20–25 minutes until the water has been absorbed. Meanwhile, finely slice the white and pale green parts of the spring onions and place in a small bowl. Add the juice of the lime and set aside to macerate. Once the lentils are cooked, place them in a roomy bowl. Add the avocado, diced into cubes of about 1cm (slightly less than ½ an inch), the dill and pepitos. Take the onions out of the juice with a slotted spoon and add them to the bowl. Discard all but 1 tablespoon of the lime juice. Add the olive oil to it, seasoning with salt and pepper, and whisk into a dressing. Pour this over the salad ingredients and toss together gently but thoroughly. Serve immediately.